This is ooey, gooey, delicious and healthy! Use your favorite whole grain or sprouted grain bread for these sandwiches. We love it on original Ezekiel bread. Perfect for dipping into your favorite homemade tomato soup, easy creamy tomato soup or bisque! Place a layer of pepper jack cheese slices on each of 3 pieces of Ezekiel bread. 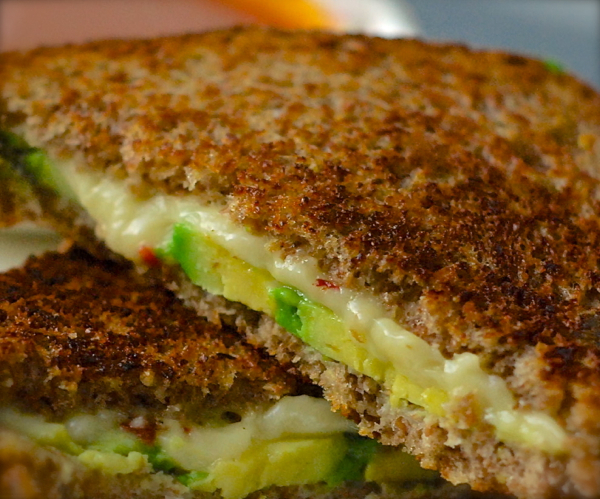 Top the cheese slices with thin slices of Hass avocado. Place the other 3 pieces of Ezekiel bread on each of the sandwiches. Butter the outsides of the sandwiches on both pieces of bread. Toast in a skillet set over medium heat until toasted on both sides and the cheese is melted. Remove from skillet. Slice on the diagonal. Serve.